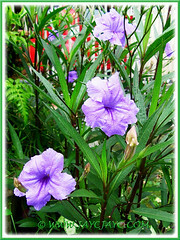 Ruellia simplex or better known by its synonyms R. brittoniana and R. tweediana, is a delightful plant to have in one’s home garden. We got several plants in three small poly bags for a steal… really dirt cheap for just RM10. These lovely plants came to mind when we wanted to overhaul our outer border about six months ago. We needed a fast-growing evergreen perennial that can tolerate full sun, and possess just the right height and colours for the back of our border. And, Britton’s Wild Petunia was just the perfect choice! It’ll grow up to a meter (3 ft) tall and produce smashing purple flowers all year round in our tropical climate! Besides, the contrasting dark green foliage gives a perfect backdrop for its striking blooms. The vibrant purple, petunia-like blooms are simply glorious! Though short-lived and drop off easily, the eye-catchy flowers never fail to greet us each morning. Such a joy to see these free-flowering plants beautifying that little spot. 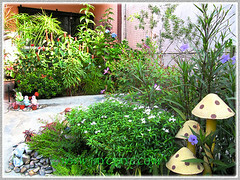 Its attractive foliage is favoured by grasshoppers, mealy bugs and white flies. 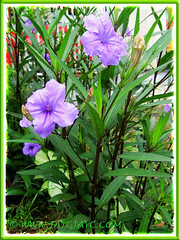 Besides, Ruellia simplex is a host plant and haven for caterpillars of several Lepidoptera (butterflies and moths). Got to watch out for these rascals! Nonetheless, Ruellia simplex’s showy flowers are attractive to bees, butterflies and birds and is a must-have plant if you’re a nature lover! Frankly, we’ve been growing the purple and pink cultivars of Katie Ruellia (the dwarf form) from as far back as 2002 and have very recently added ‘Katie White’, another dwarf form to our collection. However, this is the first time that the tall-stemmed ones with purple flowers joined our little garden paradise and we couldn’t be happier. All are beautiful in their own right and much loved by us! 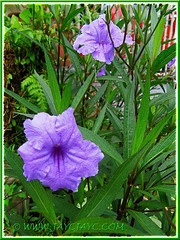 Botanical Name: Ruellia simplex (syn: Ruellia brittoniana, Ruellia angustifolia, Ruellia tweediana, Ruellia coerulea, Cryphiacanthus angustifolius, among several other synonyms). Common Name: Britton’s Wild Petunia, Desert Petunia, Mexican Petunia, Mexican Bluebell. Etymology: The genus name, Ruellia is named after Jean de la Ruelle (1474-1537), personal botanist and physician to France’s Francois 1. The species epithet simplex refers to the simple, not compound leaves. Origin: Native to Mexico, the Caribbean and in South America (Brazil, Bolivia, Paraguay, Uruguay and Argentina). Also, naturalized and cultivated elsewhere. Plant type: An ornamental and herbaceous perennial. 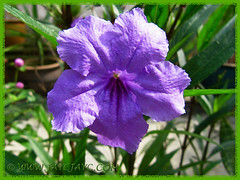 Features: Ruellia simplex is a strikingly beautiful species of the genus, Ruellia that comprises of about 150 species of evergreen perennials, mostly producing funnel-shaped flowers. Mexican Petunia is an erect and herbaceous perennial that reaches up to one meter tall and with equal spread. It is a fast grower, forming a colony of erect stalks that may be green or deep purple in colour, depending on the light conditions. Green stems in low light and purple ones in high light. Stems have nodal swelling and are adorned with oppositely arranged leaves that are dark green with a metallic bluish tinge. Leaves are linear to lance-shaped, about 15-30 cm long and up to 2 cm wide, with margins that may be smooth or serrated. They have prominent venation on both sides of the leaves. The native species or wild type has narrower and longer leaves with smaller purple flowers. The pedunculate trumpet-shaped or petunia-like flowers, measuring 4-5 cm across, with 5 wrinkled lobes in hues of blue to purple, are borne where the leaves attach to the stem. The flowers can emerge solitary or in a small cluster. Though the striking flowers are short-lived and lasting a day, blooming continues over an extended period of time. There are numerous varieties of Briton’s Wild Petunia, with flowers in pink, white and other shades of blue, as well as dwarf varieties that are below 30 cm in height. It produces green, longitudinal seed capsules up to 2.5cm long that turn brown when ripe. Each of these cylindrical capsules are explosively dehiscent and contains about 20 seeds that can self-sow aggressively. Besides spreading via seed, Mexican Bluebell can reproduce vegetatively via rhizomes, cuttings and stem sprouts from underground or above where low branches droop to the ground and root at the leaf nodes to form new plants. 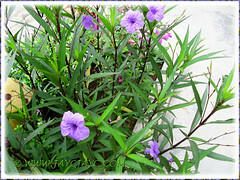 Hence, Ruellia simplex can be invasive in ideal growing conditions if uncontrolled. Culture (Care): Ruellia simplex grows easily with minimum care and thrives in a wide range of growing conditions. Light: Full sun for best growth and flowering, though can tolerate light to partial shade. Plants will bloom profusely if located in hot and sunny areas. Moisture: Medium water requirements. Tolerates both dry and wet conditions but grows best in wet or marshy areas. Soil: Prefers moist soil yet well-drained. Adaptable to any kind of soil, clay or sand. Others: Feed once monthly with a balanced all-purpose fertilizer. Prune three-quarter way down as plants age to encourage branching and increase flowering or to maintain shape. Deadheading is not required. Staking may sometimes be necessary to prevent weak stems/branches from drooping due to low light conditions. Best to grow them in full sun to encourage production of strong erect stems and plentiful blooms. As and when necessary to control the colony of plants from getting too large, simply shovel straight into the root ball to discard the excess plants or hand-pull the seedlings and use them to propagate new ones in pots. They are hardly bothered by serious insect or disease problems. However, check the underside of leaves occasionally to prevent infestation of mealy bugs and white flies. Watch out for caterpillars and grasshoppers that love to feed on its leaves. For subtropical and temperate regions: Hardiness: USDA Zone 8-11. Though a tropical perennial, it can be planted as an annual in cooler areas. Best to plant in early spring to spur growth and bloom. Flowering is predominantly from late spring to early fall or until frost. Locate plants in bright light or direct sunlight to encourage production of more flowers. A prolific bloomer throughout the hottest seasons. Pruning is essential to keep it tidy. The Florida Exotic Pest Plant Council has listed it as a Category 1 invasive species. Propagation: Easily propagated by seeds, cuttings or division. 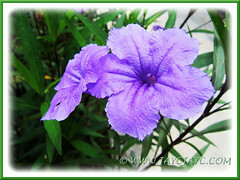 Usage: Ruellia simplex are excellent ornamental plants for containers and planters. They add colour and interest when used for mass planting or as background plants in flower beds and borders. Ideal plants for poolside or to create dense and colourful hedges in home gardens. Also, can be featured as landscaping shrubs along median strip of highways/byways and roundabouts. Plant Mexican Petunia if you’re a nature lover to attract bees, butterflies and birds. Bougainvillea Species – grow and marvel its beauty! Epidendrum orchids: so diverse, yet easiest to grow! This is truly a remarkable plant. Though it has a similar name as the common Ruellias. I find this tall ones are truly beautiful. I think there is another type – the deep red one. I have those in my garden and perhaps get these too to compliment the colour contrast. Have a lovely warm Christmas and a wonderful New Year John & Jacq! May God bless and prosper you for the coming New Year! Thanks for your lovely greetings, my friend. John and I would like to wish you and family too: “A Blessed And Joyous Christmas, And A Wonderful, Successful, Fulfilling And Healthy New Year 2014 With God’s Manifold Blessings Always”. Today I just bought 2 of these from the Portland Maine flower show (In March with snow still on the ground and more to come!) and then went online to find out more about these. Came to your website. I will try to keep mine newbies alive for a few months inside until warmer temperatures and sunshine finally come north and I can enjoy these outside!! Thanks for the info and growing advice! James a red One!!!! Are we sure? I’ve never seen such a thing. 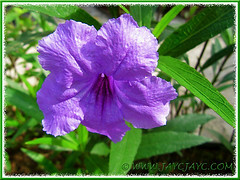 I would be in Ruellia heaven if its true? Is it a dark red?